(WACO) – More than 860 Texas State Technical College students met potential employers from throughout the nation and Texas on Thursday at its Industry Job Fair. Students were lining up to register about a half hour before the 9 a.m. start of the event at the Murray Watson Jr. Student Recreation Center. 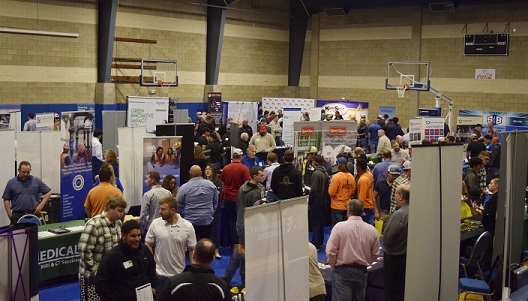 Inside, students were treated to more than 100 companies looking to fill jobs for diesel equipment mechanics, industrial maintenance workers, instrumentation employees, electricians, plumbers and welders. Galaxy Builders Ltd. in San Antonio has hired six TSTC graduates in recent years, said Ramiro Contreras, the company’s executive vice president. “I have had really good success,” he said. Contreras said he was searching for potential assistant project managers. “There’s a misconception that everyone swings a hammer,” he said. Boeing attended its first campus Industry Job Fair, with representatives seeking aviation mechanics, industrial maintenance workers and electrical employees. Some TSTC alumni returned to campus to job recruit. Joseph Jacobs, a support services manager for the Waco Independent School District, graduated in 2000 from TSTC with an Associate of Applied Science degree in Computer Networking and Systems Administration. He said the school district, one of Waco’s largest employers, looks for more than teachers. Jacobs said computer networking is one of the fields that workers are sought for. Students asked questions, clutched company brochures and handed out resumes to business representatives. Cesar Vazquez, 19, of Red Oak is studying in the Diesel Equipment Technology program. He talked to a few companies and felt good about his job prospects. Tanner Whitsel, 19, of Giddings is also studying in the Diesel Equipment Technology program. This entry was posted in Waco on March 21, 2019 by Daniel Perry.